After the last meet at Milehouse in December 2010 was called off at the last minute due to a burst pipe, this meet took place successfully without any adverse events, once Kenny and Mike constructed a new door for the front of the wood burning stove (the usual glass door was broken on arrival) ensuring a cosy hut for the weekend, and we discovered that the microwave didn’t work, only momentarily, because the electricity metre needed topping up. 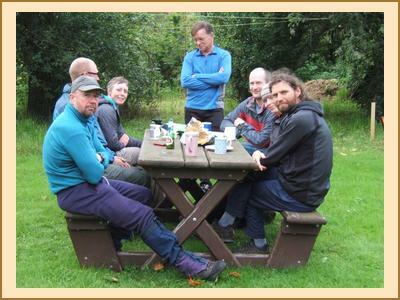 All ten members attending agreed Milehouse was a great meet venue: a very comfortable and well equipped hut (and stocked with sufficient loo rolls and cleaning products to last until at least 2020!). The weather forecast prior to the weekend was not encouraging with much heavy rain forecast – Kenny’s advice was to bring plenty of beer! Rebecca and Gillian had planned to join the meet but didn’t make it in the end, and Iain decided to abandon his Knoydart plans in light of the weather predictions and join us in Milehouse instead. Saturday turned out to be a much better day than expected with the local area being largely free of rain and quite sunny. Fiona C headed into a Corbett in Glen Feshie, and Fiona R, Mike, Tim and Iain tackled a couple of Corbetts, Gairbeinn and Meall na h-Aisre, at the south eastern edge of the Monadh Liath hills. Pete and I set off planning to do a low level cycle in the Abernethy Forest but were persuaded by the brightening weather to cycle into, and part way up, Bynack More – admittedly, the final plod to the summit was on foot! Unfortunately the descent was slowed somewhat by the repair of multiple punctures on Pete’s bike. Fiona M, Alison C and Chris found the best weather of the day an hour’s drive north, at the relatively new sport climbing crag at Moy, just outside Contin, better known as the Costa Del Moy by some! Very positive reports of a good, easily accessible sport climbing venue with some great routes at various grades. Kenny decided to give climbing at Moy a miss as he unfortunately had a few injuries following an incident while cycling north the previous day, and headed off to explore the Feshie Ridge instead. Sunday brought weather more true to the forecast and a few of us headed off south quite sharp as a result. Fiona R and Mike stopped off en route and did a Corbett in the Drumochter hills. Chris and Tim did likewise but decided to make a slightly longer day of it and bagged two Corbetts in the rain. 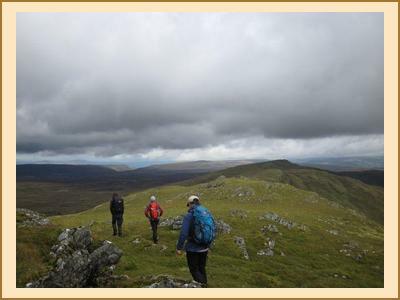 As it was a bank holiday weekend for a few folk, Alison and Kenny did some local tourism on Sunday and stayed on to Monday when they did one of the Eastern Drumochter hills and a nearby (previously unclaimed by Alison C) Munro top. Iain set off in very poor conditions on Sunday to do Creag Mhor (a Corbett close to Bynack More) but was forced to retreat because the burn in Coire Odhar was swollen with the heavy rainfall and impassable. The edge was taken off his disappointment by a cake and latte at the Mountain Cafe in Aviemore and the good company of two LSMC ladies who were also staying at the hut that evening. On Monday he did Carn an Fhreicedain, one of the duller Corbetts, but brought to life by seeing numerous little families of Grouse and Ptarmigan, and literally dozens of mountain hares.